Tulsa Ballet’s Graduate Program is designed for post-secondary dancers, aged 17-22 intent on a professional career in dance. The intensive program will focus on developing the dancers’ technical and artistic abilities while challenging their versatility as an artist. Classes will include Ballet technique, pointe, variations, pas de deux, modern and repertoire. 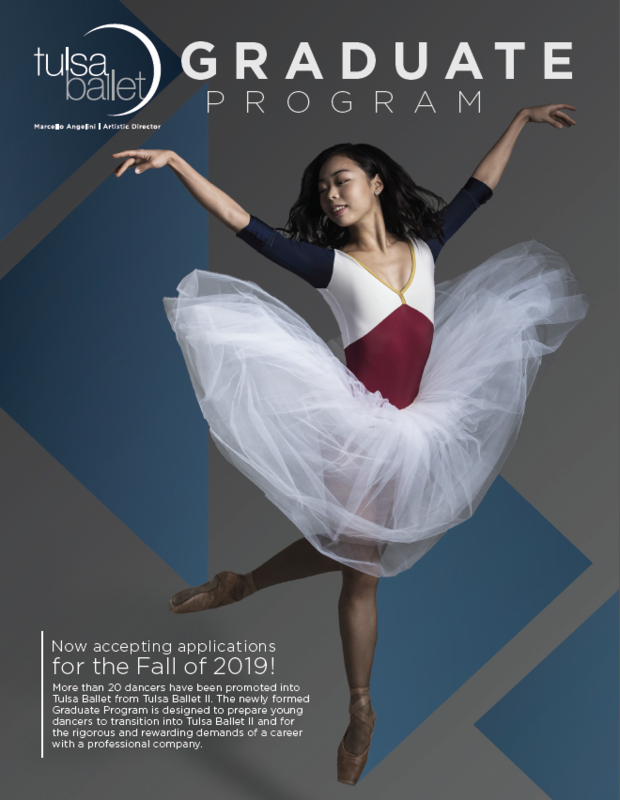 The Graduate Program will have performance opportunities to develop confidence and stage experience, including performing with Tulsa Ballet Center for Dance Education and with Tulsa Ballet II or Main Company at the discretion of the Artistic Director. Students will also be supported with audition needs, including: resume creation, headshots/dance photos and video preparation. All interested applicants are required to attend Tulsa Ballet’s Summer Intensive. Interested applicants can apply by attending a Summer Intensive audition site or by sending a video and resume to education@tulsaballet.org. Students will receive audition results from their application via email. Summer Housing and Tuition information can be found at tulsaballet.org. Graduate students are responsible for their own housing during the school year. Contact us at education@tulsaballet.org or 918-712-5327.